Great Fiat Fullback van Leasing & Contract Hire Deals. Our Fiat Fullback Lease Deals. 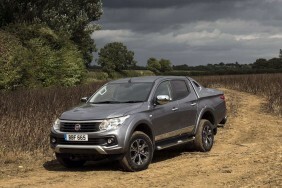 Fiat is bravely pitching this Fullback at a starting price slightly higher than its Mitsubishi L200 equivalent. You're looking at an entry fee of around £21,000 for the base 'SX' version, which is about £1,000 more than an equivalent L200 Challenger-spec Doublecab model. However, bring the Mitsubishi up to this Fiat's level of spec and you'd probably have to pay as much, if not a bit more. Go for the plusher 'LX'-spec Fullback variant and you'll be loking at an asking price of around £23,000 - with an extra £1,400 premium to pay on top of that if you want an automatic gearbox. The top 'Cross' variant costs around £26,500. The 'LX' variant is very well equipped indeed. Included features run to 'keyless go' locking, full leather upholstery, electrically-adjusted and heated front seats, dual-zone climate control, bi-xenon headlamps with washers, enhanced body styling, privacy glass and a 6.1-inch touchscreen infotainment system with DAB, Bluetooth connectivity and satellite navigation as standard. Lane Departure Warning, a reversing camera and a comfort-oriented ""Touring"" suspension are also included in the LX specification. When equipped with a five-speed automatic transmission, the LX version adds an upgraded 7-inch infotainment system and transmission paddle gear shifters.